The signs said 'dismount' and they did. Cyclists in Dublin held a lunchtime protest against signs advising people on bikes to stop and dismount when approaching the Luas Cross City line. Organised by I BIKE Dublin, the protest saw approximately 35 cyclists wheeling their bikes along the new Luas line, starting at the College Green before continuing up Nassau Street. One of the busiest areas in the city centre, protestors also selected Nassau Street since it was where the controversial signs were erected prior to the line's opening on Saturday. These signs have received heavy criticism from a number of Dublin cycling groups since they first appeared, mainly because they are being seen as an inadequate solution to the safety of cyclists. In particular, Dublin Cycling Campaign were vocal in their anger in the days leading up to the opening of the new line; they pointed out that the signs failed to take into account what cyclists should do after dismounting. Thanks for the update, now could you please tell us what you expect people to do after they dismount their bikes? *Instructions unclear* Walk bike on road? On tram tracks? On (busiest in town) footpath? The National Transport Authority had previously discussed using rubber in the lines' grooves back in early 2012. This rubber would only be depressed under the pressure of the Luas wheels. However, the proposal was rejected due to the estimated cost of €800,000 per kilometre and the need for regular replacements. 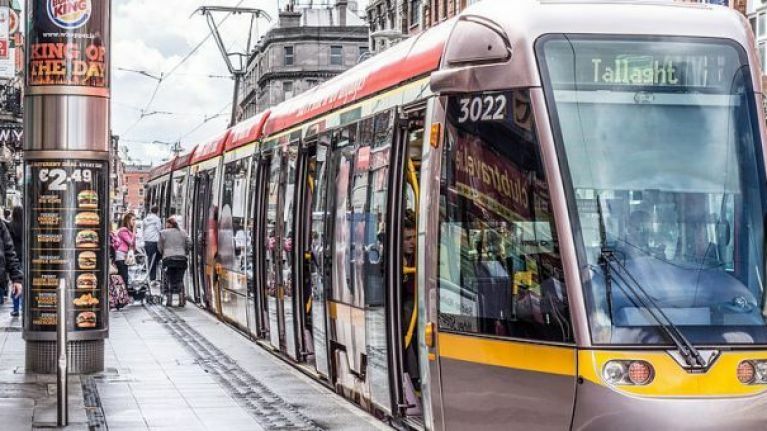 Dublin City Council also rejected a proposal by the NTA to ban cyclists from using areas shared by the Luas, buses and taxis on Dawson Street, Lower Grafton Street, O'Connell Street and Nassau Street in order to guarantee their safety. Dublin Cycling Campaign have called for cycling routes to be maintained on Harcourt Street, Dawson Street and College Green, while also requesting that a new route be established from Stephen's Green West to Merrion Row. The campaign raised the matter at the An Bord Pleanála oral hearing into the Cross City Line, but have since said that their concerns are being ignored.